These were from ages ago...note the lack of weight loss - we were not fitness freaks back then! Oh my!! These are hilarious! 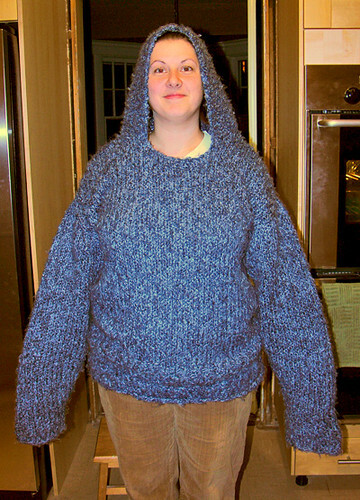 I should dig up some of my favourite knitting disasters. I don't think I took pictures of the slipper that could fit three 'man' feet. For the longest time I was on the lookout for a one-legged giant so that the slipper and knitting would not have been wasted. It literally never occurred to me to rip it out. And holy crap - weird seeing you guys like that. You are the hottie couple! 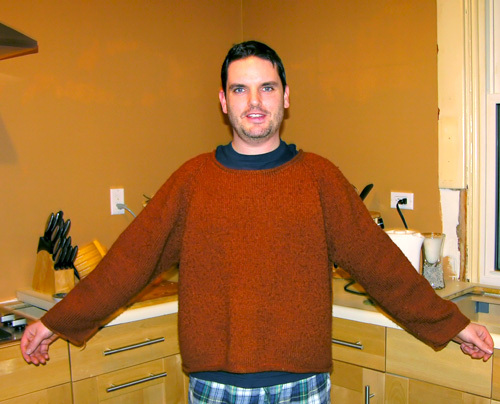 I keep the big blue sweater at the cottage and use it for warmth at night. And the cat likes to sleep on it. haha! omg hilarious. The blue sweater makes me think of a teletubbie. all my disaster knits never saw the light of day. must be cozy at the bottom of a garbage bin. Garbage! Blasphemy! You rip, roll, and reknit! My needles are gonna shoot lightning bolts at you! 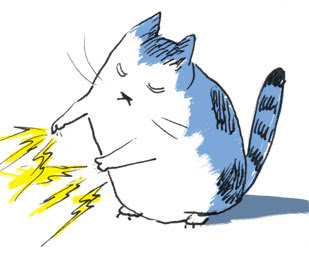 that kitty is driving me insane. pic is awesome colleen! Awesome! The blue one is Sully from Monsters Inc. Inspired Health and BIE treatment?